Professor Alfred Coroz is a famous Geology scientist attended a conference of Geology in the college of Earth sciences in King Abdel Aziz University. I asked him: Do you have information which indicate that the Arabian Peninsula had once upon a time, been covered by gardens and field? He replied: Yes, it is a well-known fact that it was so and the Geologists know it very well. Because if you dig at any place, you will find the traces which show that it was once orchards and gardens. There are many evidence which indicate this fact and one of them is FAO village which has been discovered under the sand of the Empty Quarter. I again asked him: Do you have evidence that indicated that the Arabian Peninsula again would be green orchards, and gardens with streams of water? He replied by saying that this is a fact that we know and the Geologists know it very well. They know this fact through measurement and calculations. We can estimate that this fact will take place in the near future. I asked him: How? He replied by saying that. Because we studied the past history of the Earth and we found that it has gone through an era called the Glacial Epoch. It means that the water of the sea turns ice and gets accumulated at the North Pole and then creeps towards the south. It immerses its surrounding and consequently changes the climate of the Earth. 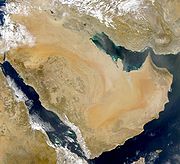 The Arabian Peninsula will get affected and turns into one of most rich lands with rains and rivers. The climate also will be called. I was linking between the floods and rains that take place at Abha area that which happen on North Europe. I was meditating and asked him: can you confirm this for us? He said: Yes, this is an inescapable fact. I told him, then who told the prophet Mohammed (PBUH) about this fact. All what you said is already mentioned in the saying of the Prophet Mohammed (PBUH). The prophet said, “the hour will not take place unless the land of Arabs again turns into orchards and rivers”. [Refer to Sahih Muslim] Who said to the Prophet Mohammed (PBUH) that the land of Arab was orchards and rivers so that he used the term “again turns”. The geologist thought for sometimes and said: The Romans. Then I asked him “Who told the Prophet that it will again turns into orchards and rivers. The geologist though and though and then said: “from the above!” Then I told him: write down. He wrote by his own handwriting: The scientific facts mentioned in Quran and Sunna amazed me. We could not know than before. Only the modern scientific method confirmed them now. This indicates that the prophet Mohammed (PBUH) received these facts from Allah though the divine revelation. Elzindani said: “O honored brothers: This is the stand of and unbeliever German. I felt that the Muslim Nation is in front if a great responsibility of spreading Islam. I can say that if the eminent world leaders find the evidence they immediately embrace Islam. They do not only do so but they also write &publish what they have found. If the Muslim Nation works earnestly one third of the scientist on Earth will embrace Islam only within ten or fifteen years. I swear by Allah that I met this German scientist for only two hours and then he wrote admitting that Islam is a divine revelation. This is one of the giants of science who wrote admitting this fact. This shows that there is only one science, one fact and one God. We, the Muslim are possessing the truth within our hands and if we except efforts to explain truth for non-Muslims they will embrace Islam. Now, we know that science is discovering many facts that have already been revealed by Quran and Sunna. This will continue till non-Muslims realize that Quran is a divine revelation, the truth from Allah revealed to the prophet Mohammed (PBUH). Allah promised to proof for non-Muslim that Quran is the truth. Allah says, “Soon will We shows them our signs in the (furthest) Regions (of the earth), and in their own souls, until to becomes manifest to them that doth witness All things?” [41:53]. This is the age of science and very soon science itself will show that Quran is the Truth, and Islam is the most proper method of life. Source: “Science id the path of faith” By: Shaikh Abdel Majeed Elzindani.